I'd like to introduce you to some exceptional women. Last year, illustrators Arielle Jovellanos and Janet Sung organized the Ladies of Literature 2 Illustration Anthology. 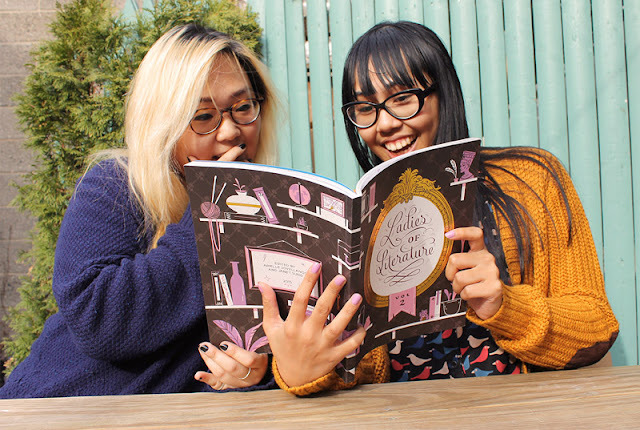 They invited 100 artists to draw their favorite female characters from literature, ran a successful Kickstarter to fund the book printing, packaged and delivered around 1,300 copies of the book, and managed to have enough funds left over to give a payout to all the artists involved. I was so impressed by their organization and professionalism, I asked Arielle and Janet for an interview so I could pick their brains. If you're considering doing an art-based Kickstarter or collaborative project, trust me, you'll want to read this. 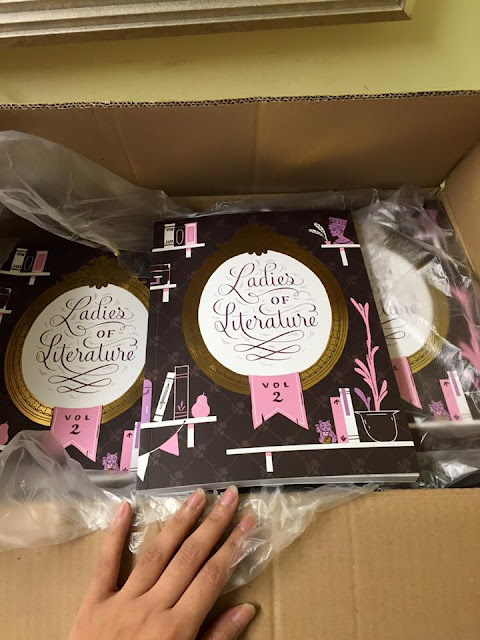 How did Ladies of Literature: Volume 1 get started? The first Ladies of Literature started fairly modestly in 2013. It was funded through pre-orders via Storenvy and primarily word-of-mouth through reblogs on Tumblr. We had organized a few other collaborative projects prior to this, which helped us test the waters and build up our online audiences. It also helped that a lot of our participating artists also had pre-existing online presences--especially within YA book fandom--that allowed us to reach certain corners of the internet that we might not have been able to reach on our own. 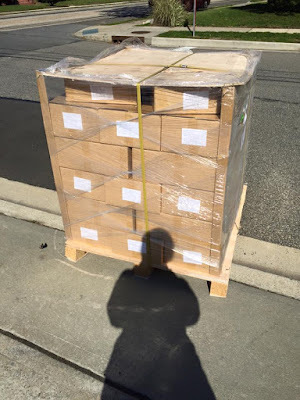 We were able to fund and sell a larger print run than anticipated! All the money we received was used to pay for the cost of production, and any excess was donated to classroom literacy projects via DonorsChoose.org. Why did you decide to use Kickstarter for Volume 2? We’d been organizing zines together for the past couple of years, and for each project we took on we did our best to experiment or try something new with subject matter, page count, or artist involvement. We gradually worked our way up to the point of wanting to do something bigger. We decided to use Kickstarter for the second volume because of all of recent success we’d seen our peers experience with crowd sourced funding. Kickstarter allowed for a wider reach that other social media platforms lacked. Plus, since Volume 1 had already been successful, we really wanted to find a way to top the quality, make it even better, and expand our audience outside of tumblr! How did you spread the word about submissions for Volume 2? How did you choose which artists would be in the book? Our main goal in Volume 2 was to include way more artists so we made a post about an open call for portfolios with the existing following we accrued from Volume 1. Then we asked our returning Volume 1 artists to reblog it and spread the word to their other artist friends and followers through social media. We received an overwhelming amount of responses! Janet thought that we would get 50 maximum, and I (Arielle) thought we’d get at least 150. We wound up receiving over 400 portfolios. From there, we spent nights looking through every portfolio and finding the artists we felt were most suited to the prompt. We were definitely looking at how well artists could tell a story through a single image, since the focus of Volume 2 was for people to discover new female narratives through our project. Through this, we got a little taste of how it must feel to be an art director! We went through so many rounds of eliminations, it became really difficult at the end--there is really a lot of talent out there! Ultimately, we would have loved to include every person who expressed interest but unfortunately page counts and budgets pretty much tie our hands! What did you do to prepare for the Kickstarter? The Kickstarter site itself offered a ton of resources for creators regarding project stats, trends, and tips. Both of us are fans of other projects funded through Kickstarter, so it helped to take note of what we thought other Kickstarter pages’ strengths were and what was emphasized. How did you decide on a funding goal? Since this was our first time budgeting for a project of this scale, we worked with a lot of estimates to come up with our funding goal. We looked at price quotes for all the big things we knew we needed to allot money for--printing service for the book, supplies for creating rewards, payment for artists, postage and packaging material, etc.--and then we added some padding to each category to account for unforeseen costs. Things like paying for expedited supply shipping or buying more rolls of tape--stuff like that adds up, so it’s good to be prepared. The Kickstarter was a big success, more than doubling its original goal. Why do you think the campaign was so successful? Without a doubt, we have to give a huge hand to our fantastic roster of artists. Without their amazing work, we wouldn’t have a book at all. We love the idea that all these female characters resonate so strongly with our artists and that this anthology allows them to share these characters with readers who may be looking for the next book to add to their shelves. We felt the idea behind the anthology just really appeals to readers and fans of representation in storytelling. It all comes from a place of love, of feeling passionate about a book and wanting to recommend it. We really believe that seeing--not just complex female characters--but a wide range of complex female characters from multiple walks of life can be really empowering! 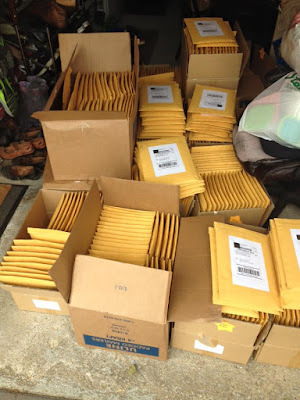 What was the fulfillment process like? 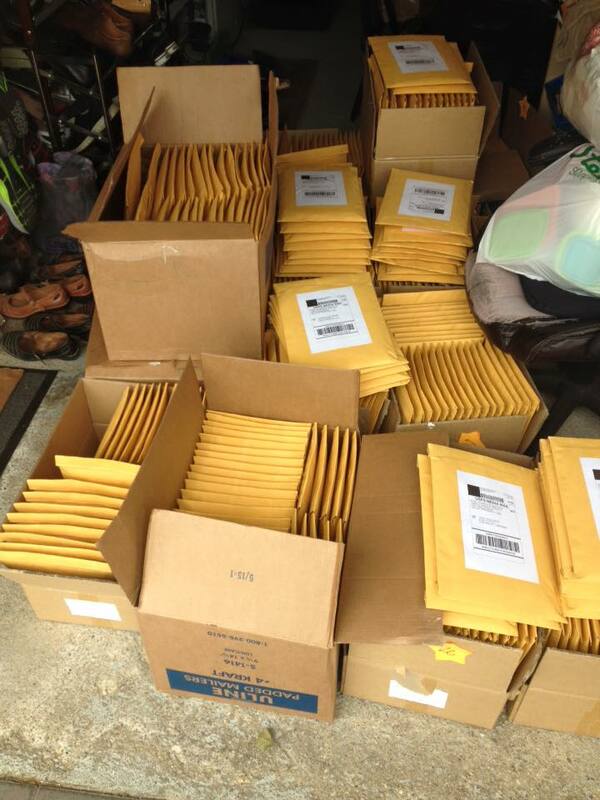 How many books did you ship out, and how did you manage to do it with just the two of you? Were there any moments during the process when you regretted taking on such a big project? There were definitely a few stress points, but there was never a feeling of regret. We started and ended it as a passion project on top of our regular work lives. With everything else we had going on, we made it a priority to run Volume 2 in a way that kept it fun for us and everyone involved because that was the point of it all! Now that it’s all over, it’s nice to kick our feet up a bit, but we’re still taking care of a few logistics from the aftermath. All in all, we’re so glad we did it because we met so many new friends through it! How do you feel about running another collaborative project in the future? We’d definitely be open to the possibility of running another collaborative project. This is our fourth time organizing together, and I don’t think we’re ready to stop just yet! We definitely feel like we’ve “leveled up” our project management skills significantly and can’t wait to bring that to our next venture! Are there any lessons you learned from Volume 2 that you would take into consideration for future projects? Volume 2 took us a little over a year to complete. We knew that it would take a long time going in, but we think we (now) have a much better idea of what that the value of time and effort on a project like this actually means. That’s something we would consider when planning the sheer scale of our next project for sure. Do you have any advice for other artists thinking about running a collaborative project or Kickstarter? If you’re thinking about starting a project, just go for it! It’s the best feeling in the world to hold a finished book/zine/poster/whatever you made in your hands. Funding the project will always be a part of the equation, so if you decide to go the Kickstarter route, make sure you do your research! It also helps to have a buddy lend you an extra eye (and a shoulder to cry on) along the way! Thank you ladies for taking the time to share your secrets of project management with us! You are an inspiration! What a great post, Kelley! I love reading about Kickstarters. There is something absolutely magical about starting AND finishing something you decided to start on your own, especially when other people are involved and support you... I think that working as a team is not only rewarding, but it makes it easier to keep going when you feel like giving up, or when difficulties arise.